Philadelphia Eagles quarterbacks Carson Wentz and Nick Foles talk during minicamp at the NovaCare Complex. On Thursday night, the Eagles will get their Super Bowl rings. Once the Birds get their new bling, head coach Doug Pederson believes it will officially be time for the team to move on from the 2017 season, rip off those underdog masks and flip the calendar over to 2018. But first, they had to wrap up their final day of mandatory minicamp, the last day they'll be on the field together until the final week of July. Prior to Thursday morning's practice at the NovaCare Complex, Pederson met with the media for the last time before training camp and provided updates on several injured players, as well as offered up a little more info on what can be expected when we next see the Birds out on the field. One of the big storylines all offseason — and one that's definitely not going away any time soon — has been the quarterback situation. And while it's obvious that this is Wentz's team, Pederson did admit earlier in the week that Foles is currently the starter. In other words, if there was a game this weekend, Foles would be starting (because Wentz isn't ready). But fear not, because the Eagles don't play for almost two months, and don't play a meaningful game for almost three, so that can certainly change in the interim. The real question, however, is when that transition from Foles back to Wentz will take place, and how it will look during the process. Depending on where Wentz is in his rehab when camp opens — he said on Wednesday that contact was the next, last hurdle he had to clear – the Birds will need to make sure both quarterbacks have a chance to work with the first-team offense, especially new targets like WR Mike Wallace and TE Dallas Goedert. That way, if there's any chance Wentz won't be ready, Foles will have had a chance to develop a rapport with those guys. And, once Wentz is cleared, he won't be playing catchup, trying to find that rhythm on the fly. Q. 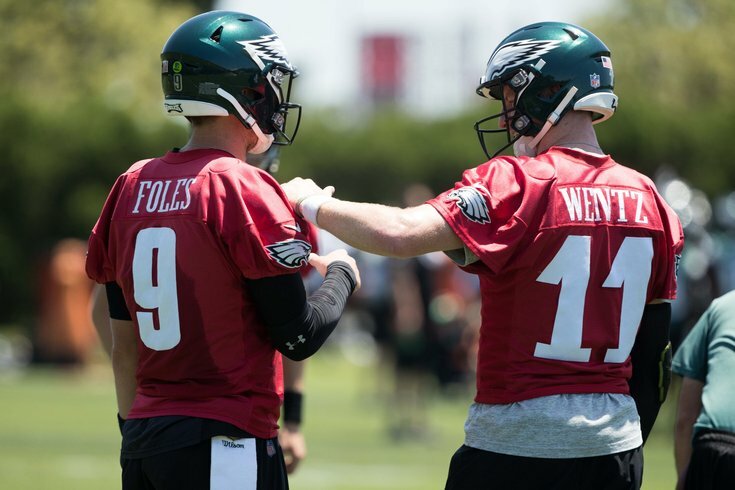 This spring you've had a couple new receivers come in, and they're building a rapport with QB Nick Foles, but how difficult is that going to be if Nick isn't the guy who ends up being the quarterback at the start of the season and they have to kind of start all over again? DOUG PEDERSON: Well, I think as [QB] Carson [Wentz] gets stronger and we're able to give him more reps as we go, particularly in training camp, seven-on-sevens, things like that, we can continue to -- go back to my first year where we were trying to get all three guys equal amount of reps going through the first couple weeks of training camp. It's going to be maybe the same type of thing where Nick [and] Carson are working with the ones, working with the starters. We're not losing a lot of that valuable time. But at the same time, it's just -- it's on them. It's on the players sometimes to work a little extra outside of the confines of practice to make sure that they're getting the proper reps they need [and] the proper throws that they need to work with guys like [WR] Mike [Wallace]. And then even when [WR] Alshon [Jeffery] comes back, getting him out there and getting him caught up. It can be a challenge, but I'm definitely not going to worry too much about it as we go. It's still a long time before we play. On Wednesday, Wentz spoke to reporters about where he is in the recovery process and what these next five weeks have in store for his surgically-repaired left knee. When asked about his expectations for the 25-year-old quarterback, Pederson said he didn't want to paint himself into a corner. Q. You talked about the benchmark with QB Carson Wentz yesterday. Where do you expect him to be come training camp in terms of his progress? DOUG PEDERSON: Obviously, he'll be further down the line. We still have roughly July -- we're into June, July, August, two and a half, three months before we get to that bridge. But again, it just falls back to our medical staff, being on the same page with them, and making sure that he's 100 percent. I'm sure he's going to be eager and in his mind possibly ready to go. But again, I want to make sure that he's 100 percent. Bottom line. And really with all our guys before we put them back out there. I just don't want to risk anything further. Q. Do you have any hopes or expectations for where Wentz may be? DOUG PEDERSON: I'm not going to put myself in a box that way. I'm just going to see how it unfolds, quite honestly. We'll prepare and get our guys ready, and if they're ready, great; if not, we'll move on from there, too. Two members of the Eagles vaunted defensive line — Brandon Graham (ankle) and Tim Jernigan (back) — are still recovering from offseason surgeries and have yet to practice this spring. Pederson provided an update of sorts on those two prior to practice. Q. We haven't seen DE Brandon Graham and DT Tim Jernigan out on the field. I assume they're rehabbing indoors. What's their progress been, and what do you expect from them when training camp starts? DOUG PEDERSON: Both guys are progressing nicely. It's another one -- both guys really, because of the nature of their injuries, that we just want to make sure they're both 100 percent, quite honestly. They'll be monitored going into training camp and even throughout the practices to make sure that they're ready when the time comes to step on the field. And then there's wideout Alshon Jeffery (shoulder), who we found out after the season had played much of the year with a torn rotator cuff. And just like with his two injured defensive lineman — and his starting quarterback, for that matter — Pederson wants to make sure he's 100 percent before letting him back out there. Q. How about WR Alshon Jeffery, what's the timeline layout for him? DOUG PEDERSON: Same thing. We're still progressing. He's doing nice with his rehab, getting stronger every day. Camp is going to be real important. Really for these three guys we're talking about, even these next five weeks are going to be important through their rehab leading up to camp. But again, go back to last year and what we did with him with a lot of the rest and getting him ready for the season. As we keep monitoring, keep progressing, keep sort of inching towards opening day. There won't be any joint practices this summer, as Pederson revealed on Wednesday. But he did end Thursday's presser by revealing that there will be live tackling during some portions of camp. We'll have to wait and see just how often that is the case — and how long it lasts if there are a few early injuries. Q. Will you still have tackle periods in camp? DOUG PEDERSON: I will. Yeah, I will. The time off between now and training camp provides a nice break for the players and coaches. But with so much time away, and so many other distractions, this also has the potential to be a very dangerous time for the players — and a stressful one for the coaches. Pederson's message to his players? Just keep working, because it doesn't get any easier from here. Q. It's that time of year, obviously – veteran players know it, but what's your message to the younger guys in this lull? DOUG PEDERSON: The message from me to them and really to the whole team was about sacrifice; what are you willing to give up between now and camp to prove that we can make another run? Again, nothing is ever handed to us. We have to go earn it. We faced adversity. The team was very resilient last year, but what are you willing to give up individually between now and camp to help this football team get back to that championship game again? Things aren't going to be handed to us. The target got a little bit bigger on our backs, and we embrace that. Moving forward, that's going to be our challenge. That's going to be our motivation. Again, looking forward to camp.